wow you are getting on with it. Loving it. I like the way you interlock the two components. 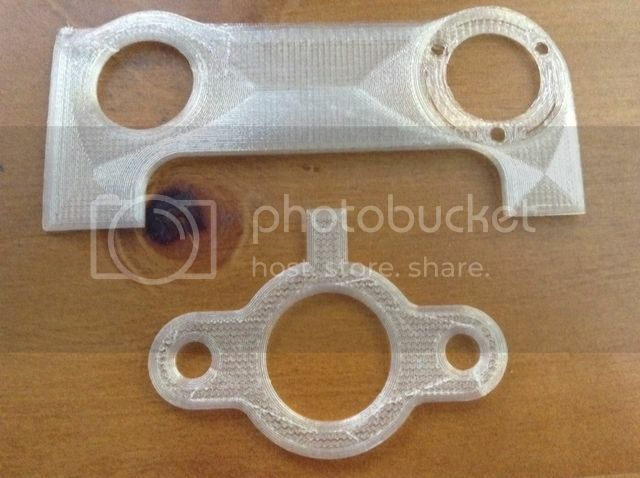 One of my friends has been 3D printing for a few years, and it is really cool the completely differnet solutions to mechanical problems he comes up with, compared to a subtractive worker (Machinist). Look forward to seeing how this pans out. 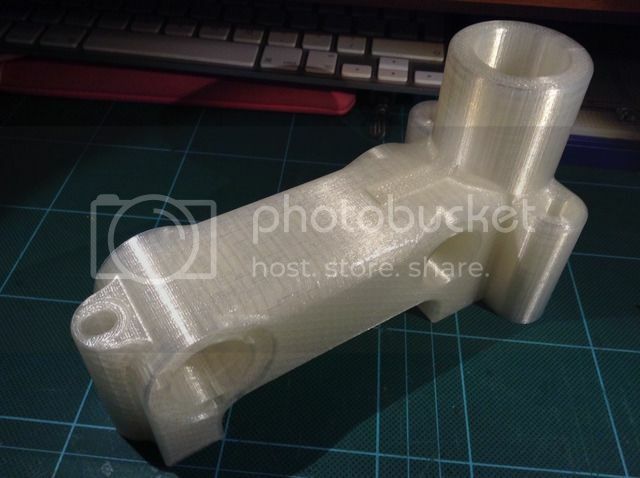 You can still lost PLA cast the parts if they turn out to lack rigidity. LOL. I think you got it spot on Mark, this is as much a challenge and as such the design will morph as problems arise. Take for instance the vertical part of the casting. To make that more rigid rather than add ribbing to the vertical column I would be better moving the fixing round 90 degrees then mirror it, so instead of one bolt it has two fixing bolts. I am going to try acrylic rod in 25 and 30mm for the bars. The 30mm should allow me to machine in the spiral with some yet to be devise cunning geared gadget. So there goes the idea of not having plastic on plastic bearings. No worries on this one closing up Norman, it will be printed with the slit or some yet to be thought of bar clamping method. I expect to get none of this right first time and now for some delay whilst I prepare further modelled parts. You already know Norman, my biggest challenge will be when I start building the parts away from the bars and things start to flex. That is where my main concerns are, and if I can devise alterations to stiffen those parts without them becoming unwieldily. Joules, are you going to make the plastic parts the same size as the cast iron ones would be or are you going to make them larger wherever possible? I see no advantage to copy the CI parts verbatim unless you want the finished product to look identical? Cheers guys, your input is very welcome. Arbalist I am treating the casting like a listed monument, alterations and extensions will be in keeping with the sytle of building. No I am heavily modifying the parts to make best use of my 3D printing knowledge and experience. 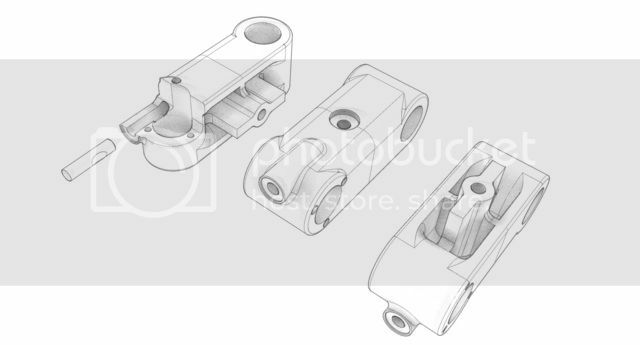 The devil is truly in the detail, at present I have no idea how long just preparing the CAD models will take. You can't just tap plastic and expect fasteners to behave as though in metal, so in places inserts and buttons must be incorporated into the print, but nothing too complex. This is the altered casting parts. I moved the fixing points and doubled them to make the column more rigid, this also impacted on the blending of the two parts, so I had to alter that. I am also missing some of the chamfering I will add for the weld fillets. 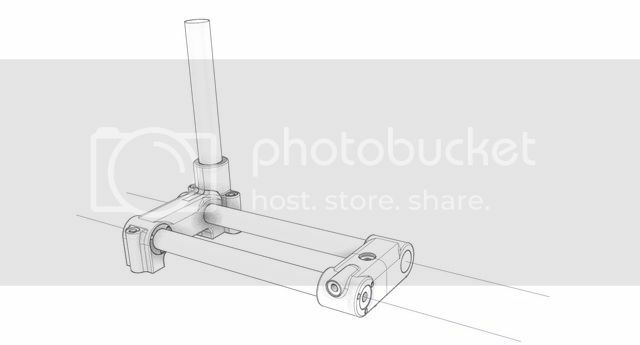 The original CAD model I got is pretty awful for 3D printing as it isn't watertight and has many overlapping and twisted surfaces, so I am pretty much having to redraw each part from scratch for 3D print ready parts. What I learn here will be applied to other jobs and projects so none of it is a waste of time. 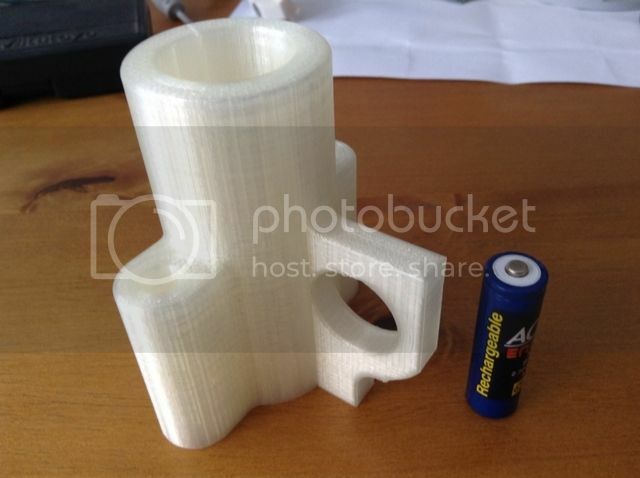 So far the wall thickness is around 7mm, which for PLA has huge strength if you print in the 40-50% infill range. The vertical column will also be drilled and tapped in the base, so allowing it to be bolted to the mounting board/plate. what are you planning to mount your plastic Quorn on? A piece of granite counter top and bolts compressing the plastic could help enormously with rigidity! Another option is to sleeve the bolts so creep can be limited then skim the sleeves if needed later on. I am so thankful it was only 1hr into this 24hr print. Serves me right for being cocky and trying to print both parts at the same time. The larger part was right on the edge of the bed and must have got cooled faster than the rest, so it started to curl. It's not a total loss, I was a bit BELT & BRACES in my print settings. I went a bit heavy on the wall thickness, again this could have contributed to the curl as it gets really thin where it started to lift. I had printed a skirt to hold it down, but it seems to have pulled away from that. Maybe printing on a raft would be better, but the surface finish suffers. On to the next one, new settings to be determined from close inspection of these parts. 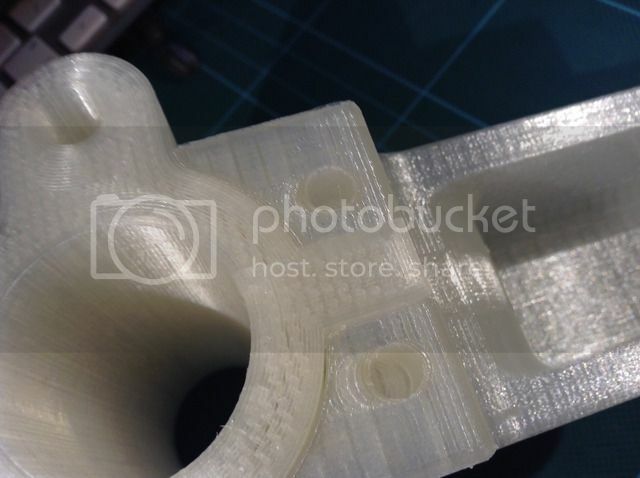 I am printing in 0.15mm layers, 50mm/s print speed and at 210℃ and 45% infill, think that last one can be dropped to 40% That will also help speed up the next print, and I shall do each part separately. You could use epoxy resin to bond the plastic parts to the base. There will be little stress on the plastic and the bonding should be plenty strong enough. 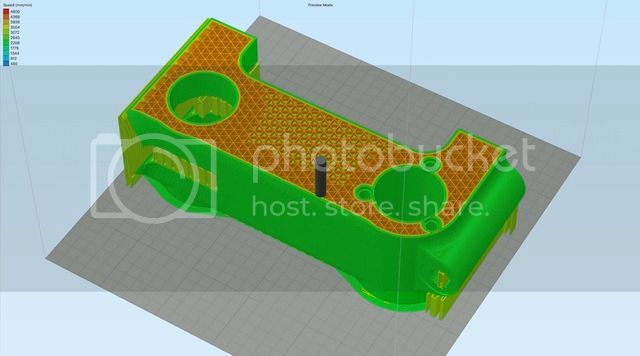 You can incorporate a few holes in the design of the printed parts for dowel pins for added joint strength. Cheers nrml, epoxy just doesn't bond to the clean surface of PLA, now printing the parts with dowel holes is a pretty good idea. Will look into doing that on a later revision of this first print. The print is progressing now so see what we end up with tomorrow. Not so happy with the infill, but this print is VERY rigid. Next part due off the printer in 10hrs. 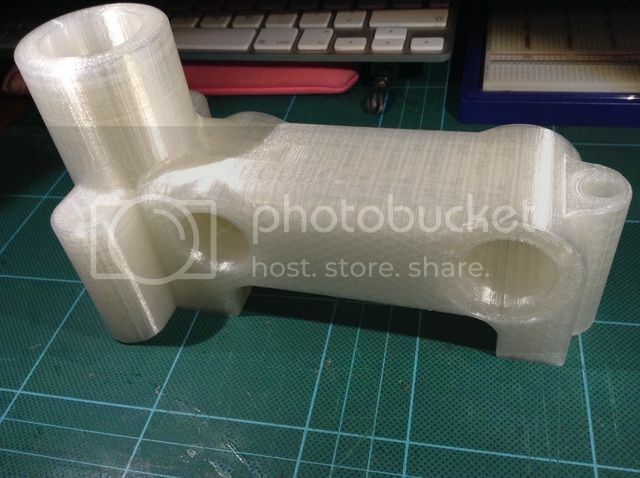 If it all goes to plan, this should be the internal structure (infill) I will use in all the future prints. A good 10hrs later, second part of the first casting done. Quick clean up, pulling off the support material and push them together for a trial fit. This is the fit with no clean up. Needle file will knock off some of the small blobs on the mating surfaces. I won't know how accurate my centres are till I can put some bars in. Theory has it any error should be the same in the next part printed, so hope the centres are equal, next print will confirm that. I picked up my Perspex rod today and the 30mm is a very snug fit in the vertical column. I'm a gnats under on the 25mm, if the hole is elliptical, "Norman" it will get a skim if thats the case. Last one for now showing the quality of fit and the holes for the dowel pins, they probably will be fitted with epoxy, but more to grout them in than glue. I'm a lot happier in the print quality on this second part. Once this section gets the bars in and welded, I can skim the underside to get them true. Thanks for that John, but when I first started it was hellishly frustrating getting through the early learning curve. I see what guys here do in metal and realise I won't achieve what they can. I am just happy to have found something that fits my skill set, and that my craft skills can compliment it. I can design stuff I don't have the skill or tools to machine. Next step, I have remodelled the other end supporting the bars, and moved its mounting position into the middle of the casting. Nothing jumps out at me that may cause any issue here and I have recessed the fixing. Rather than split the casting I have gone for an 8mm pin that will pull and wedge the bar in order to lock it. Again, if anyone see's a fault in my logic please pipe up. Let me also know if this style of representation is easier than the rendered images. 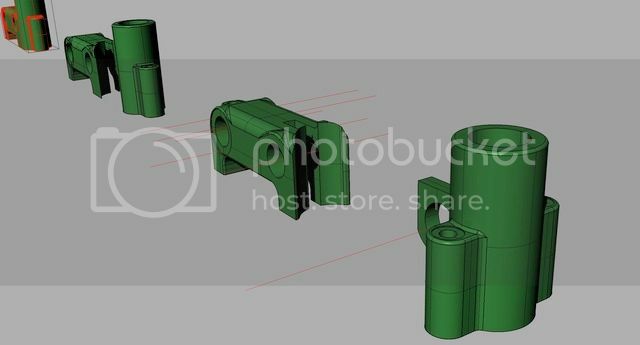 Once I finalise this part and get it printed we should be ready to assemble as per below. The eventual plan is to re-print the castings in a suitable colour, but for now translucent works well as I can shine a light and see where parts are. Prof Chaddock would have been highly amused, I don't think he was shy of using new materials and techniques. Not worried about the grit at the moment, more interested in at least getting it working. If parts are cheap to make once its completed I will just wear them out and replace. What about seals wiping the bars ? I will give the felt a go, but can't imagine that being great at keep grit off, but I thought rubber seals might keep it at bay. As the next major part is a 10hr print and will wait till tomorrow I have got a quicker 1hr job on the printer. 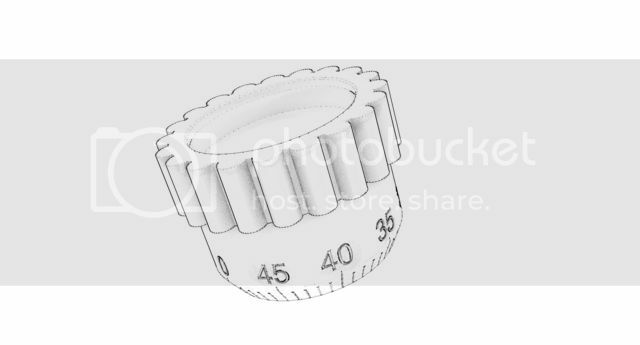 In this case the micrometer thimble. Since knurling looks naff 3D printed, I have gone for something a little better suited to 3D printing. It's been printed in black and I will try to put white paint in the numerals and graduation marks once it's done. This part is printing at 0.1mm to capture the fine detail in the numerals. is it done yet !